Graft survival is the key to fat grafting success. Every part of our fat grafting procedure is designed to make the procedure as predictable as possible to ensure the best results and maximum patient safety. We are the first in United States to use both 2-D and 3-D High definition ultrasound to monitor to the progress of our fat grafting patients. This allows us to study our patients non-invasively and without radiation to be sure we are getting maximum survival of our fat grafts. In the office we use the Touchview high resolution ultrasound imaging system which is easily portable and allows us to visualize the tissues and structures under the skin, including grafted fat, muscle, tendons, arteries, veins. We are also able to visualize many abnormal structures including ruptured breast implants, cysts and other abnormal masses. The device can also be used in the operating room to monitor exact placement of fat grafts when needed. The Touchview Terasonic device is so sensitive that it is able to detect structures less than 1mm in size. For even more detailed monitoring we use High Definition 3-D Ultrasound imaging provided nearby at the Vincon Imaging Center. As a consultant to Cytori therapeutics, Orlando plastic surgeon, Dr. Hartog is conducting ongoing research on fat grafting, and we use ultrasound imaging to monitor the progress and success of fat grafting procedures for breast reconstruction and augmentation. When fat grafting is performed, any fat that does not survive forms small oil droplets. As long as these droplets are small and limited in number, we can consider the graft to be successful, and these droplets are considered a normal finding and will be absorbed over 6-12 months. Ultrasound is a valuable tool to detect potential problems such as larger oil cysts that might need to be drained and would indicate that larger amounts of the grafted fat did not survive. using both fresh fat grafts and using the Liquid Gold Lipobank cryopreserved banked fat. 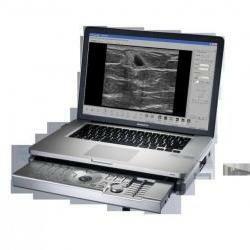 Ultrasound is also a very valuable tool for postoperative care. For example after liposuction, ultrasound can be used to locate any fluid collections that can be improved with our lymphatic drainage techniques, to speed recovery and help provide a smoother result. There are numerous ideas for future use high definition ultrasound imaging in regenerative aesthetics and reconstruction to improve our patient services and outcomes in the future.